Nicolas Dudet, founder of Mastering Freedom, is a certified health coach, certified yoga instructor, bodyworker and lifelong windsurfing athlete. Having experienced asthma his entire life, at the age of 17, he began to question the foods he was eating and how they were impacting his health and well-being. He began researching the causes of health and dis-ease and learned about how food and lifestyle choices affect the body. After learning about the acidifying and alkalizing effects of certain foods and how the body detoxifies, he quickly changed his entire lifestyle to eating exclusively raw foods with an emphasis on fruits. Within a very short amount of time, his lifelong asthmatic symptoms disappeared completely, and his breath was free! 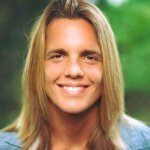 This experience inspired Nicolas to empower and teach others how to free themselves from dis-ease and embody their greatest potential in all areas of their life—freedom! Visit Nicolas Dudet’s website, MasteringFreedom.com, and YouTube channel as well as follow him on Facebook and Instagram. What does this word inspire in you? What feelings and images come to you when you imagine embodying total freedom? Freedom can mean many different things to many people, yet to me, freedom truly begins with embodying vibrant health. Our bodies are the vessels through which we experience life, and if our bodies are compromised in any way, so is every aspect of our life. Looking back on my life, I recognize that I have always sought to experience freedom. For many years as I grew up in Cancun, Mexico, freedom to me was connecting with nature and going windsurfing. Windsurfing was a huge passion of mine, and it allowed me to really connect to the present moment and experience peace and a feeling of freedom. You see, throughout my childhood and teenage years, my health was greatly compromised, and the main debilitating symptom I experienced was asthma, or a restriction of my breath. I could barely breathe when engaging in aerobic exercises, and my breathing was restricted even without doing exercise. I was told by doctors that it was something one is born with and that one can’t do anything about it other than take pharmaceutical drugs to help relieve the symptoms. I would use an inhaler whenever I could barely breathe, and even though the inhaler did allow me to breathe when I was in a crisis, this was only suppressing and toxifying my body with chemicals. 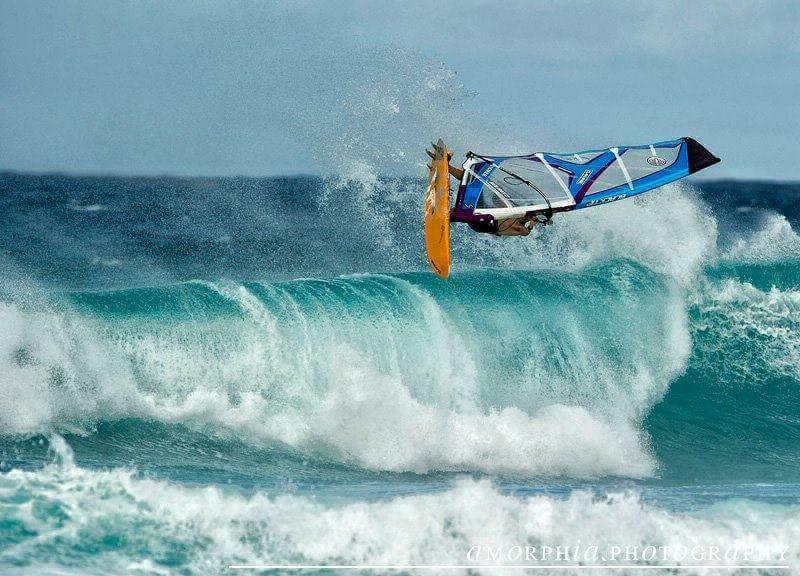 Nicolas Dudet soars in the air while windsurfing. When I was 17, turning 18, my health and life took a strong turning point. During this time, I was living in California, where I then began to take my health in my own hands and take full responsibility for my life. I started practicing yoga and began questioning many things, including the foods I was eating. In perfect timing, my older brother, Julian, came to visit, and, at the time, he was eating vegetarian. I had never met anyone who told me they were vegan or vegetarian, and the idea of not needing to eat animal products was so exciting to me. The same day this idea of not consuming meat was introduced to me, I immediately decided to cut out animal products and began to deeply research to educate myself on the topic of health. I learned all about the toxic effects of GMOs, chemicals in packaged foods and the acidifying and inflammatory effects of all animal products. Album: Kala by Trevor Hall. Place on earth: Anywhere immersed in Nature. Thing to do: Follow my heart and my highest excitement. Before I knew it, I stopped consuming all animal products and processed foods. At the same time, I began eating more whole, fresh and raw foods. To name a few of the effects I began to experience, I was feeling more energized, my skin was clearing up, and I felt mental clarity unlike I had ever experienced. 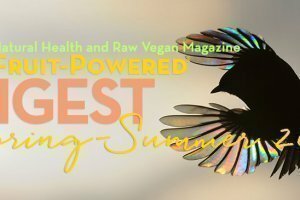 Best of all, in the following several weeks after having cut out all animal products and processed foods and increasing my raw fruit and vegetable intake, I experienced a truly profound and life-changing moment. I realized my lifelong asthma had disappeared! This happened one day as I ran full speed, sprinting and giving everything I had. Normally, after a sprint like this, I would be wheezing and panting, but this time, I was able to breathe fully and effortlessly unlike I had ever experienced in my entire life. My breath was finally free! 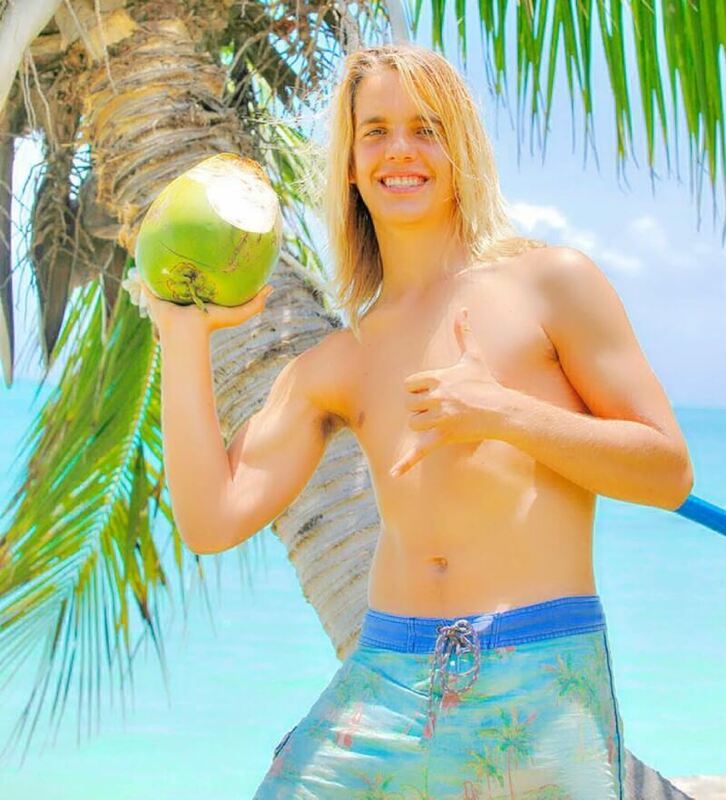 Raising a coconut, Nicolas Dudet reversed asthma while leading a vegan diet before embracing a low-fat raw food diet. This moment marked a huge stepping stone of inspiration and empowerment in my life. It affirmed that I am capable of healing myself and that with the right guidance on how to nourish and take care of our bodies, we all can truly thrive. I realized that by questioning my beliefs and the way of living that was shown to me by society, I was able to empower myself with truthful information and make changes in my lifestyle that empowered me in body, mind and spirit. This moment led me down the most wonderful journey of health and freedom as I was further inspired to continue to question and to help as many people as I can to free themselves of dis-ease and embody vibrant health. I believe that it is our birthright to experience vibrant health, and it is with this foundation that we are able to embody the full expression and infinite potential that we are. 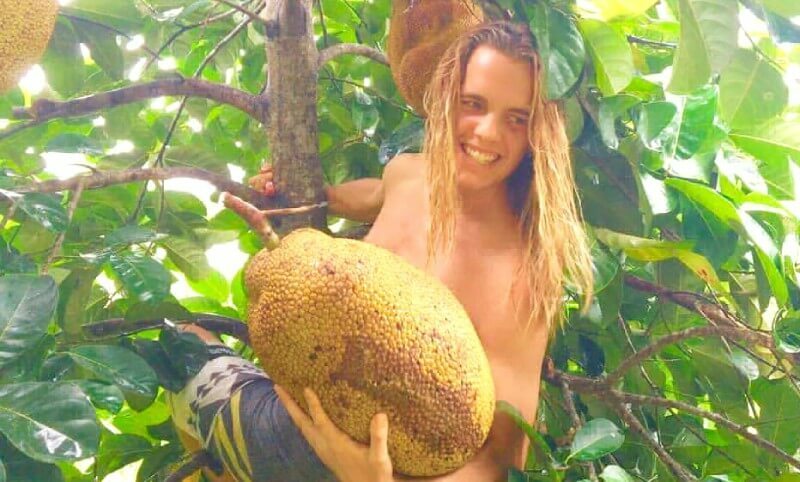 Nicolas Dudet carries a jackfruit while hanging from a tree branch. Within the first six months of first changing to a vegan lifestyle, I continued to refine and simplify the foods I ate and also detoxified my entire lifestyle by replacing toxic self-care and household products with natural options. The beautiful part about this process is that is was and has always been rooted in self-love, with the intention of loving my body to the best of my ability. At six months, I decided to start eating fully raw. I began going to the farmers’ market weekly and getting the freshest fruits and veggies I could find. I also began juicing and enjoying awesome salads and fruit and vegetable smoothies. 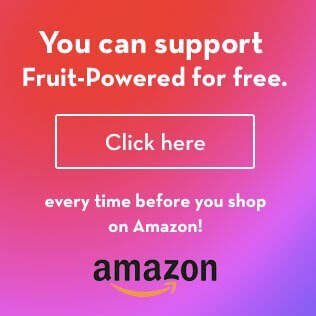 With my continued research and questioning, I came across knowledge on fruitarianism and the optimal raw food lifestyle. As soon as I came across information on a fruit-based lifestyle, it made so much sense to me! By getting to know our physiology, by observing nature and by experiencing a raw food fruit-based lifestyle, I knew I found the optimal way to nourish our bodies so we can truly thrive. I now live a raw food fruit-based lifestyle and have never felt more energized, mentally clear and joyful! It is truly a joy to give our bodies their optimal nourishment, which allows for a healing and vibrant body. 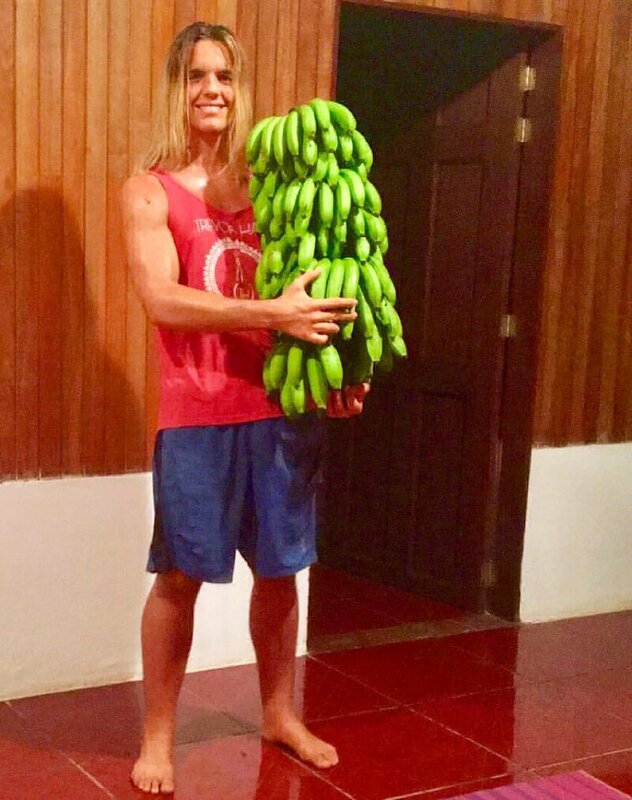 Nicolas Dudet holds dozens of bananas. Many raw fooders enjoy making bananas staple foods. An amazing part of this healing journey I embarked on is that through this process of healing my body, I began to heal my emotions, raise my consciousness and improve and create harmony in all of my relationships. With the greater clarity of mind and my emotional body, I was able to feel, process and heal my emotions. I realized it is all connected, which is why it is so powerful for us to take care of our bodies because, when we do, all aspects of our being are improved. What I find fascinating is that my change in diet led to an expansion of my awareness and consciousness. Questioning and changing the foods I ate let me to question other areas of life and led me to go within to let go of what did not serve me. Through this process, I felt like a cloud was lifted in my mind, and with this newfound mental clarity, I began to experience deeper and more profound states of inner peace and love. I began to do yoga and practice meditation, and this helped me tremendously to remember who I am and who we all really are. Nicolas Dudet discovered meditation, among other healthful practices, while leading a fruit-based raw vegan diet. Naturally, after witnessing my asthma disappear and my health skyrocket, I realized how so many people suffer unnecessarily. Vibrant health is our natural state, and our bodies inevitably heal when we support them in the right way. Recognizing this inspired in me a deep desire to help and empower others to heal from dis-ease and sickness so they may embody their greatness and infinite potential. That is the true beauty of healing ourselves: When we heal ourselves, we can assist and help heal our loved ones and the world at large, one person at a time, and, eventually, we can co-create Heaven on Earth. 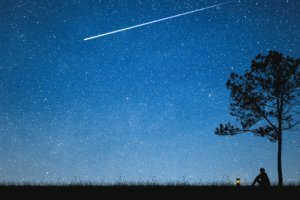 When we heal, we begin to connect with and remember the deeper meaning of our existence, and we are thus able to overflow our energy and love through inspired action with the intention to be of service for the highest good of all. As I embodied freedom in my body, I sought to embody freedom in all areas of my life and to help others do the same. Nicolas Dudet practices yoga, a lifestyle practice he adopted in recent years. Inspired by my desire to help others heal, I started to help my immediate family and friends and, soon after, started to expand on that to coach and guide others professionally, so I can be of service in the most impactful way. I have since taken coaching courses online that have helped me master the art of coaching so I can help others change and improve their lifestyle habits and, therefore, change their lives and the world for the better. In my own life, I’ve been able to witness firsthand how, through changing and healing myself, I’ve been able to positively influence and inspire countless lives. As each and every one of us heals and liberates ourselves inside, we create a ripple effect that allows us to come together as a collective family and truly envision and co-create a thriving and harmonious planet for all living beings—freedom! 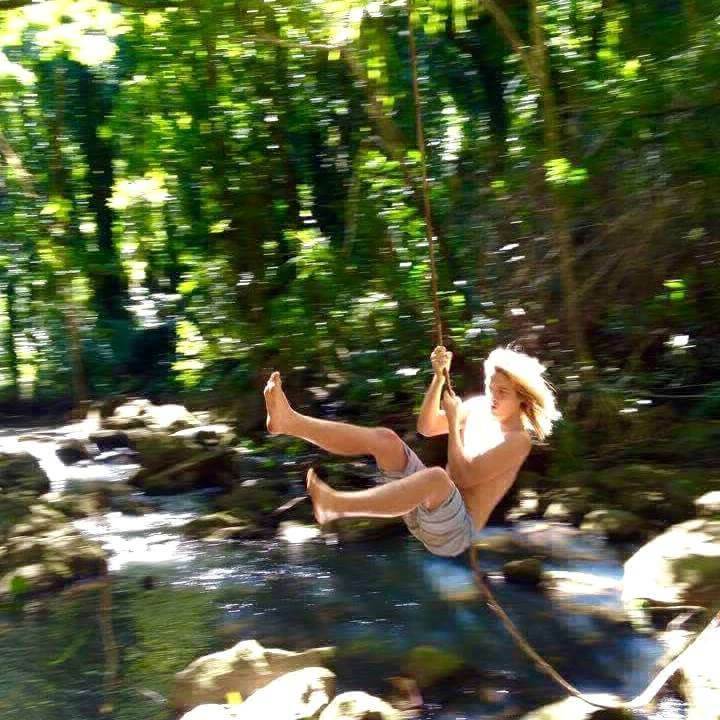 Nicolas Dudet swings from a rope, experiencing a freeing moment in the thick of nature. Freedom is a key component in Nicolas’ lifestyle journey. Nicolas Dudet, founder of Mastering Freedom, is a certified health coach, certified yoga instructor, bodyworker and lifelong windsurfing athlete. Nicolas embraced a raw food lifestyle with an emphasis on fruits. Within a very short amount of time, his lifelong asthmatic symptoms disappeared completely, and his breath was free! 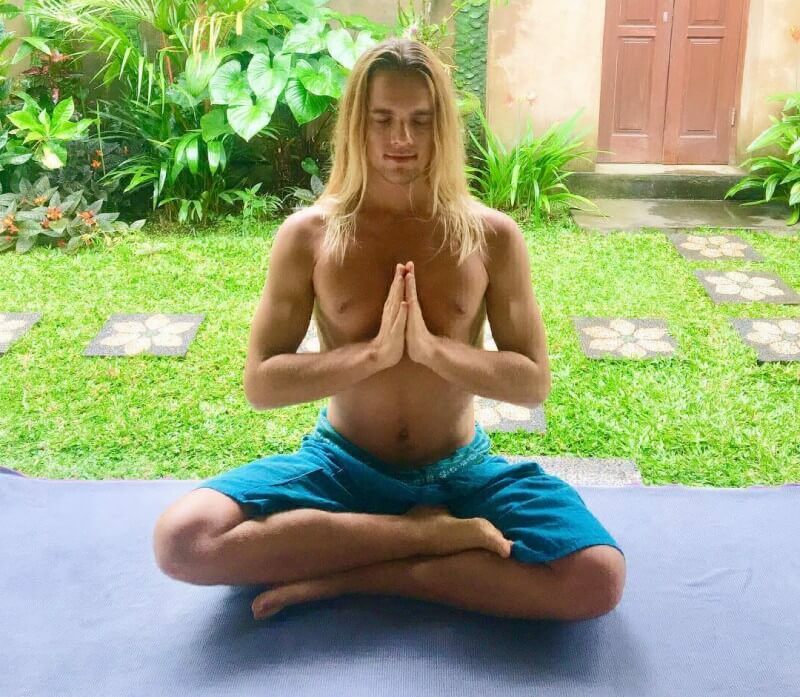 This experience inspired Nicolas to empower and teach others how to free themselves from dis-ease and embody their greatest potential in all areas of their life—freedom!